New Haven 0401 is an FA-1 1500 HP road freight Diesel locomotive, built by Alco, May 1947 (#75276). Part of the first three-unit set of road freight Diesels purchased by the New Haven (class DER-2a), this locomotive was the first Alco cab-type Diesel preserved in the United States. The 0401 (and its sisters) eliminated steam power on the New Haven’s Maybrook (NY) to New Haven freight trains. These locomotives were then used in road freight service over most main line New Haven routes. During late 1958, it was one of the four FAs selected to join a number of RS-3s that were factory rebuilt by Alco. Thanks to this rebuilding, his unit escaped the massive trade-in of the FA fleet to Alco and General Electric for new C-425s and U25Bs in 1964. It survived into Penn Central to be renumbered 1330 and painted black. 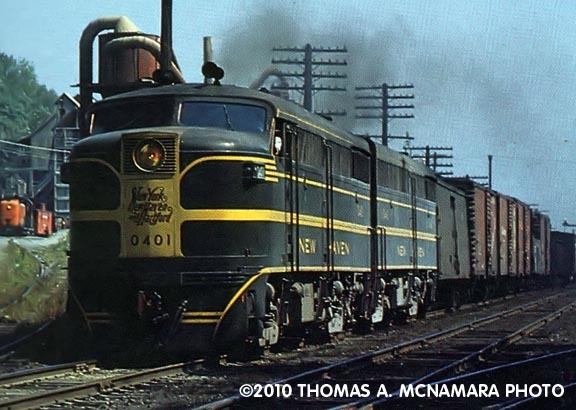 By April 1971 the 0401 had been retired and traded in to General Electric. Once again the 0401 evaded certain scrapping by being resurrected as a head end power-control cab unit for passenger service on the Long Island Rail Road in 1974 when it was renumbered 618. The unit was used in this service until 1982 and was then retired. New York area members of the RMNE kept track of the 618 and, beginning in late 1984, started an effort to obtain the locomotive. After over a year of work, a purchase agreement was reached and the 0401 became the property of the RMNE in December, 1985. She arrived on the property April 4, 1986 and her extensive restoration began in 1987. The unit was moved to safe storage on the Naugatuck Railroad in 2008.